My review of the Hyaction Jacket by Mountain Hardwear was just published on the Mountain Blog. It’s a great shell for technical adventures, so if you’re in the market, check it out. I love hearing stories about how people get into rock climbing. Mountain Gear recently published a piece I wrote about Patti Winford, a woman who started climbing through the UClimb program that Mountain Gear offers. As I’ve been teaching fulltime this fall, I haven’t gotten to do very many adventures and have spent most of my time flogging myself in the climbing gym, which is adventurous enough in its own way. Still, I did manage to write a review of the SpeedLight Jacket from Marmot on the Mountain Blog. The short version is that it’s a pretty sweet rain layer. Check it out. Despite my hyper-obsession with climbing, I’ll be the first to admit that it really is only a pastime. We’re not solving the world’s problems or making some enormous contribution to the wealth of human knowledge when we scale rocks. That said, I know for myself (and I’m sure others who share my obsession do also) that climbing still means something, something worth working for, doing without for, maybe even suffering a bit for. So what is that something? Well, that’s the million-dollar question, but I have a guess that it has to do with the kinds of relationships – with ourselves and with our partners – that climbing catalyzes. I recently published a piece, “The Purple and Blue Rope,” that takes a stab at this idea through the metaphor of the climbing rope: our connection to the rock, our connection to each other, our life line. 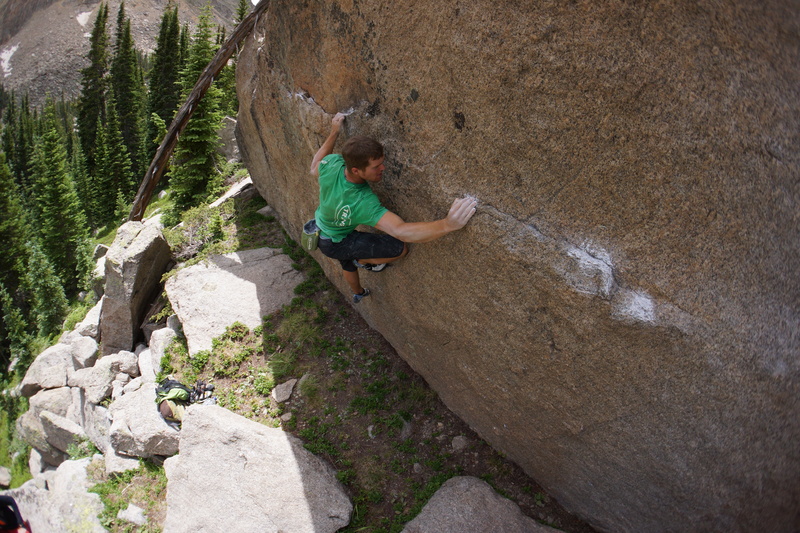 Yep, that’s me making the first ascent of The Ninja Kick Traverse near Hagerman Pass in the Tenaya Oasi. Everybody loves new climbing shoes, especially when they are awesome. It’s even cooler when they’re truly are new – as in a new model. I just published a review of a sweet new pair – the Tenaya Oasi – on the Mountain Blog. Here it is: The Tenaya Oasi. So, it’s been a long time since I’ve posted an update. I spent the summer teaching in Leadville this summer, and the busy schedule was a convenient excuse for coming up with nothing remotely interesting to write about. I did do some cool exploration of alpine boulders and walls, which I promise I’ll tell a story about in the next few weeks. In the meantime . . .
My trip to the Red last fall made me think a lot about what it means to climb hard and how failure fits into that. I also had a fun time hanging out with Brian and Josh, the inspiration for this piece I write for The Mountain Blog.